To Celebrate 90 Years Ducati have produced this Incredible Ltd Edition PANIGALE S. Limited to 500 globally, not just a painted up S but one of the most sophisticated Motorcycles Ducati have ever produced close to and using technology from Chaz Davies' World Superbike with R Geometry. The 205BHP is controlled by a raft of electronic systems including brand new DTC (EVO) which allows riders to drift and steer the bike without crashing! Bosch Cornering ABS, DQS up and down, EBC Electronic Engine Control and OHLINS Smart EC - an event based adjustment system for ultimate grip on and off the track. Carbon means a 2.5kg weight loss over standard S. Titanium Racing AKRAPOVIC Exhaust. Very, very low mileage. All books etc. FDSH. Usual Dealer Facilities. Part Exchange considered. Finance details on request. UK Mainland delivery from ONLY £149! We want clean low mileage bikes WHY? Please ring for full details and to arrange viewing of this Truly Magnificent Motorcycle. 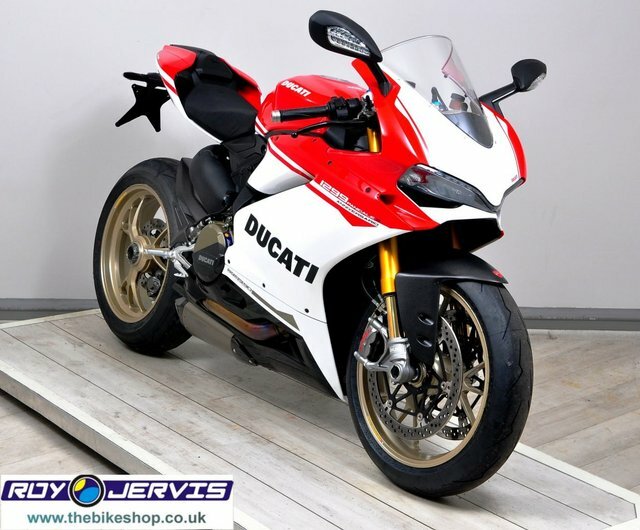 Get the best deal on a used Ducati 1299 Panigale bike for sale in Ripley, Derby by making your way to Roy Jervis Bike Shop today. You will find every available model listed here on the website, and as all our stock is competitively priced you should have no problem sourcing a pre-owned Ducati to suit your budget. Take the opportunity to browse our current range online before contacting a member of the showroom team to find out more. Our friendly and knowledgeable staff will be more than happy to answer any questions and provide advice and guidance when necessary. Alternatively, why not pay a visit to our showroom in person and take a closer look at the selection of used Ducati 1299 Panigale bike models for sale.